To mark the Queens 70 years association with the Commonwealth, the Chamber invited her representative in the county, the High Sheriff of Lancashire Tony Attard OBE to attend an event at the Raza Jamia Masjid in Accrington. The event also provided a platform to acknowledge the depth and diversity of the business community in East Lancashire. Over 80 business leaders were given a tour of the new mosque by Purves Ali and his team and were treated to a behind the scenes view of how the mosque operates as a religious and community hub. 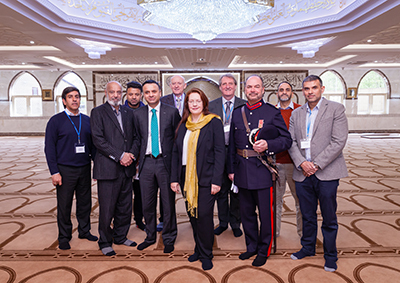 Guest speakers at the event included Purves Ali, Steve Riley of Barnfield Construction, Miranda Barker CEO Chamber, High Sheriff Tony Attard OBE, Ken Shackleton, Cardboard Box Co and Dr Javid GP. The event also provided an excellent opportunity for the business leaders to network with their peers and to develop new links within our culturally diverse region. The Chamber has plans to develop more events of this type as we recognise that support is required to develop strong inclusive networks in our region where we can celebrate the employers, innovators, wealth generators and industry leaders who drive East Lancashire’s economy. Our thanks also go to Bip Patel of Guide Security and Javid and Majid Hussain for all their guidance and support.